U.S. Forest Service Press release - SANTA BARBARA, Calif - Zaca Fire Burned area and associated trails will be reopened at noon, April 4. The Forest Service announces it will reopen the area burned by the Zaca wildfire, which burned 375 square miles for four months last year. 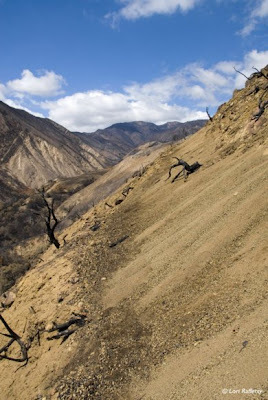 Los Padres National Forest officials today announced that the area burned by the Zaca Fire, closed to public entry since the fire began in July 2007, will be reopened at noon, April 4. "The trail system has sustained extensive damage and the public is urged to use extreme caution when traveling in the affected area," said Forest Supervisor Peggy Hernandez. The burned area, including about 167 miles of trail in the Los Padres National Forest, will be open to the public starting at noon Friday. Forest Supervisor Peggy Hernandez warns that visitors use caution, because the fire, followed by winter rains and heavy snowfall, caused significant damage to the land. She says they should watch for landslides, rockslides and unstable terrain. On the bright side, some ridge and canyon trails that were previously impassable because of heavy brush, will be open for the first time in years. The Zaca fire, the second largest California wildfire in recorded history, briefly threatened ranches and vineyards in the Santa Ynez Valley.